On our first evening back after our holiday, we went to dinner at my parents’ home. It was their friends S and T’s last night in Perth (we ‘kids’ call them “Uncle S” and “Auntie T”). Auntie T did what she always does on the last night of their stays – she cooked up a feast for the family! She’d been planning the menu for some time – in fact, she shared with me her first draft of the menu before we went on holiday! 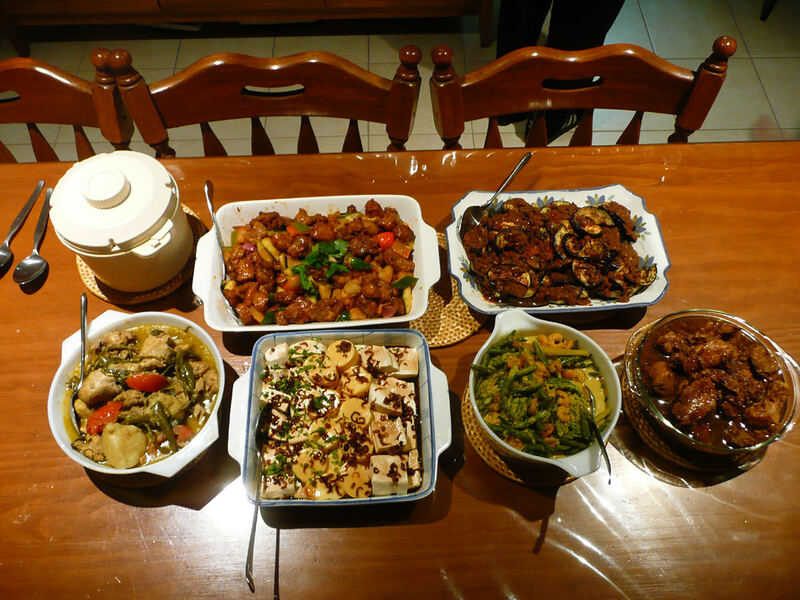 So here’s the feast – six delicious home-cooked dishes served with freshly cooked rice. This was the first pot of rice – there was a second pot ready to go when the first batch ran out (not surprisingly, it did run out, and we did dig into the second pot of rice!). 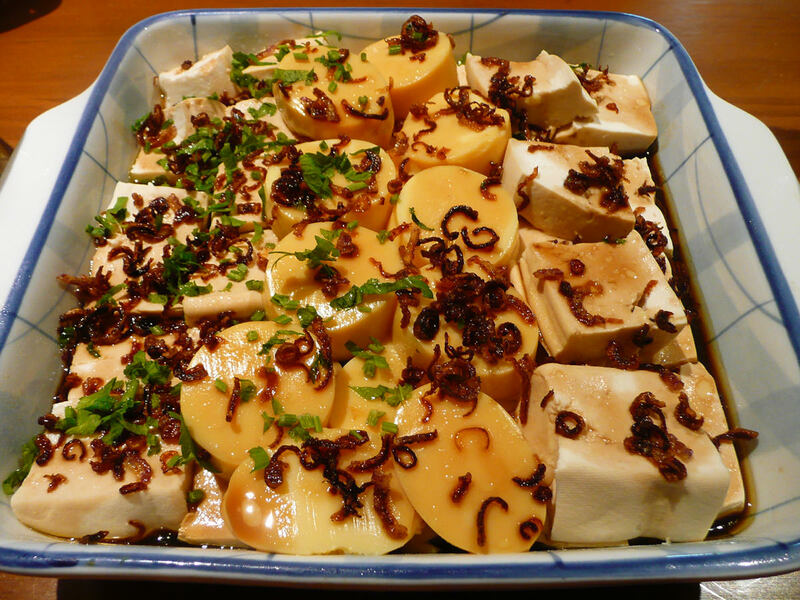 The name of this dish in Chinese translates to “onion oil tofu”. Auntie T used two different kinds of tofu, the standard firm white kind you buy in a rectangular block, and in the centre, the softer Japanese-style egg tofu. Auntie T couldn’t find shallots to fry, so the brown fried shallots you can see on top of the tofu are actually regular onions, very finely chopped. Sharp-eyed readers will notice that only half of the tofu dish has been garnished with finely chopped green stuff – that’s the coriander / cilantro. Auntie T purposely kept half the dish coriander / cilantro -free as she knows not everyone in the family likes that flavour. Auntie T had planned to cook long beans lemak – long beans in coconut milk – but since she wasn’t able to get any long beans, she used green beans instead. In the lemak sauce with the beans were plump little shrimp. 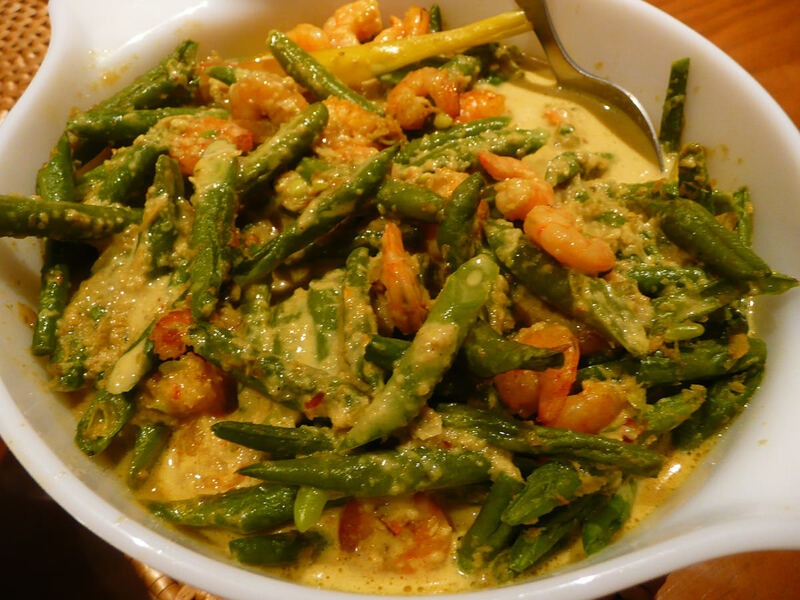 I love vegetables cooked lemak-style, and green beans are one of my favourite vegetables! 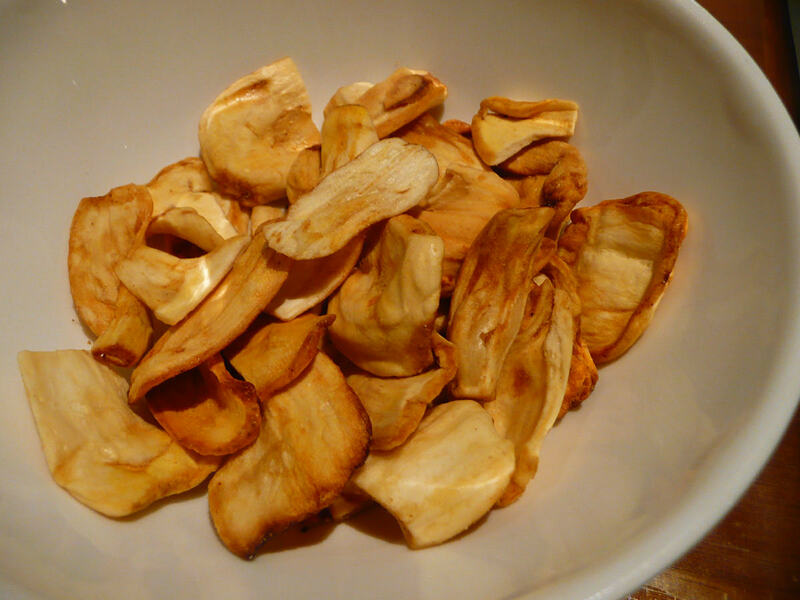 The next dish was a special request from my sister Juji – sweet and sour pork. I love Auntie T’s sweet and sour pork as much as Juji does, so I might have asked her to cook it if Juji hadn’t! 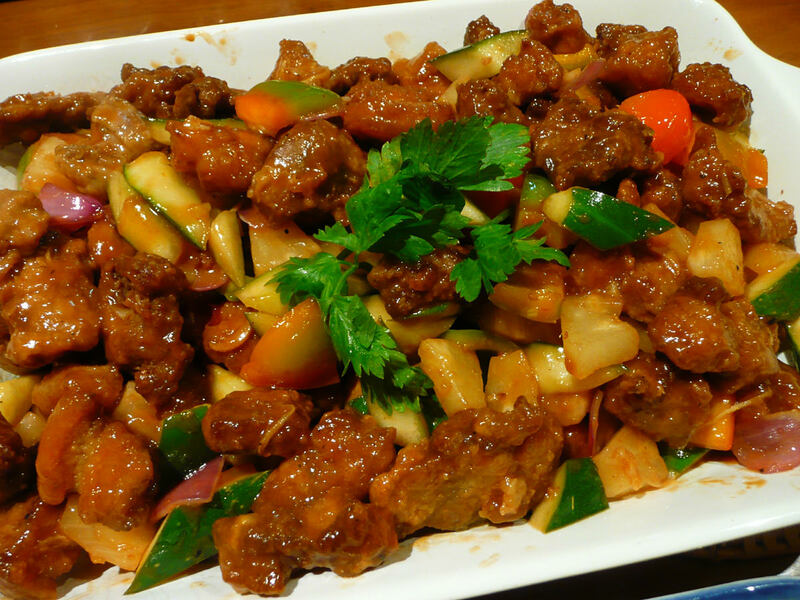 :- P The tender nuggets of pork have been coated in seasoned flour and cooked with diced vegetables (red capsicum, zucchini, red onion) and lots of sweet juicy chunks of pineapple. 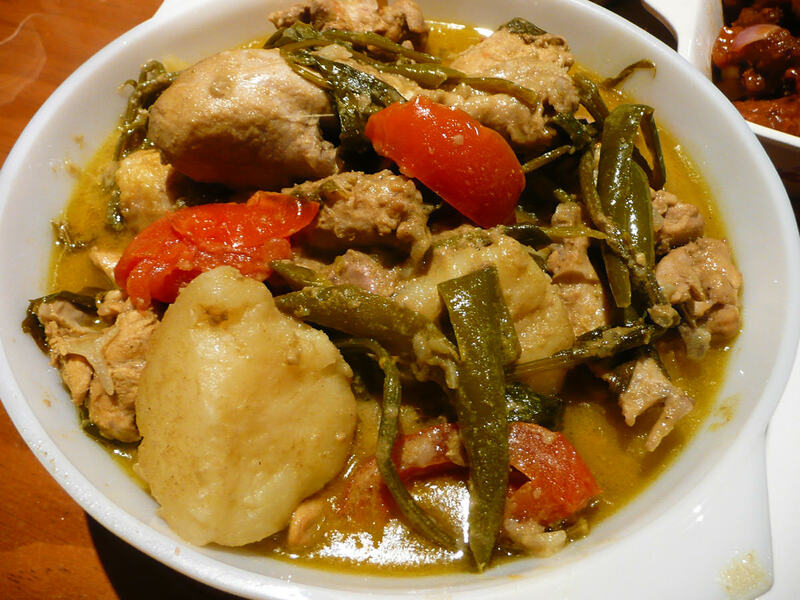 The curry was ayam (chicken) kurma, with chicken pieces, tomato and potato, garnished with sliced green chillies. 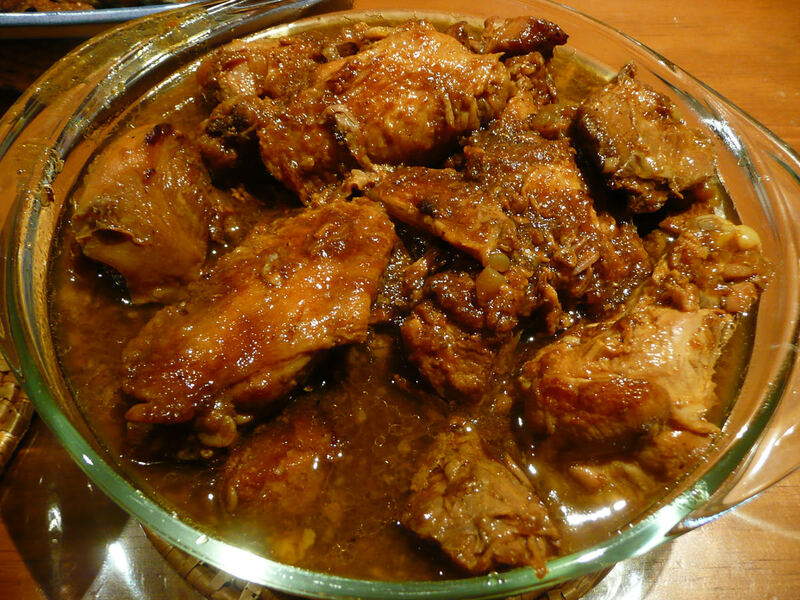 It’s quite a mild curry, the gravy delicious soaked into rice. 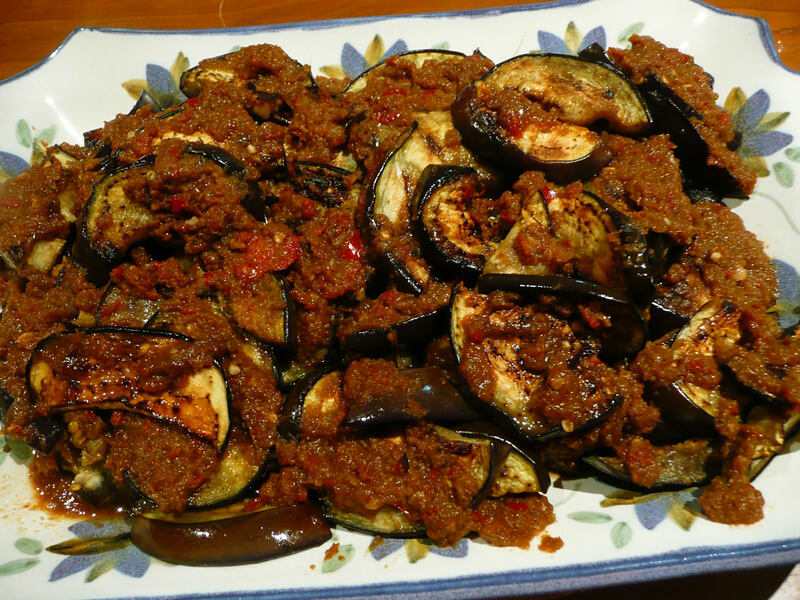 This was sambal terung (eggplant / brinjal / aubergine). I love eggplant! I really enjoyed this dish. Auntie T calls this dish “babi hong”, which sounds like a combination of Malay and Chinese words – “babi” meaning “pork”, and “hong” meaning “red”, so I guess it’s a kind of “red-cooked pork” dish. Auntie T cooked some chicken with the pork to cater for the pork lovers and the chicken lovers among us. Some of us particularly gluttonous individuals (I’m referring to myself here, of course) enjoyed the pork as well as the chicken cooked this way! 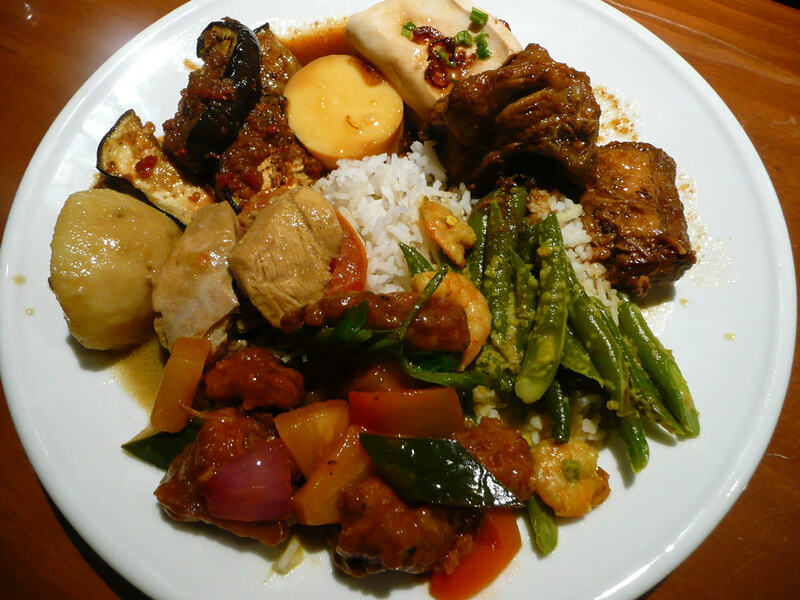 So here’s my plate, with plenty of sweet and sour pork and green beans lemak, my two favourite dishes out of the feast. Everything was delicious. Auntie T is a superb cook. My Aunties S and J came to dinner as well, and brought this lovely lemon cheesecake for dessert. The slices of lemon on top were really good – they’d been sliced thinly so you could actually eat them, peel and all, with the cheesecake. 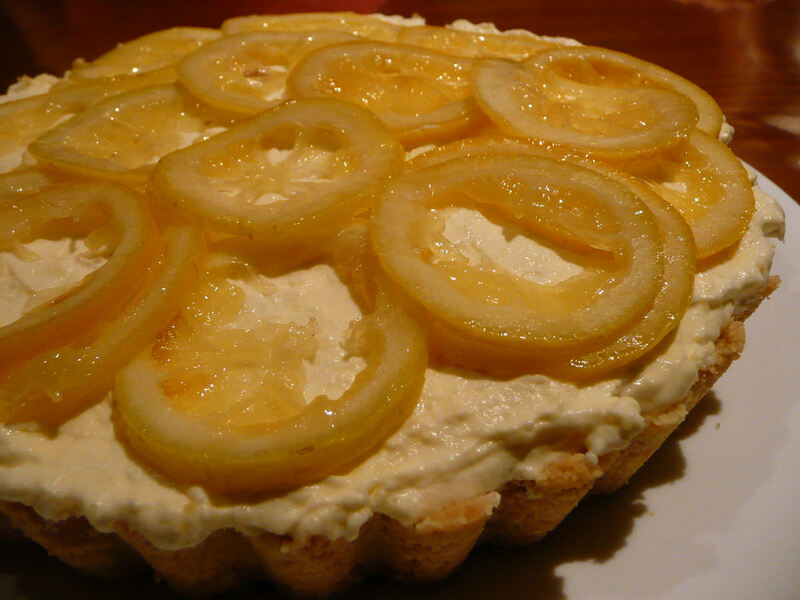 Their fresh tang combined with the sweet and creamy cheesecake for a rush of lemony flavour. We brought the Krispy Kreme doughnuts bought at Brisbane Airport along for Juji and Jay. 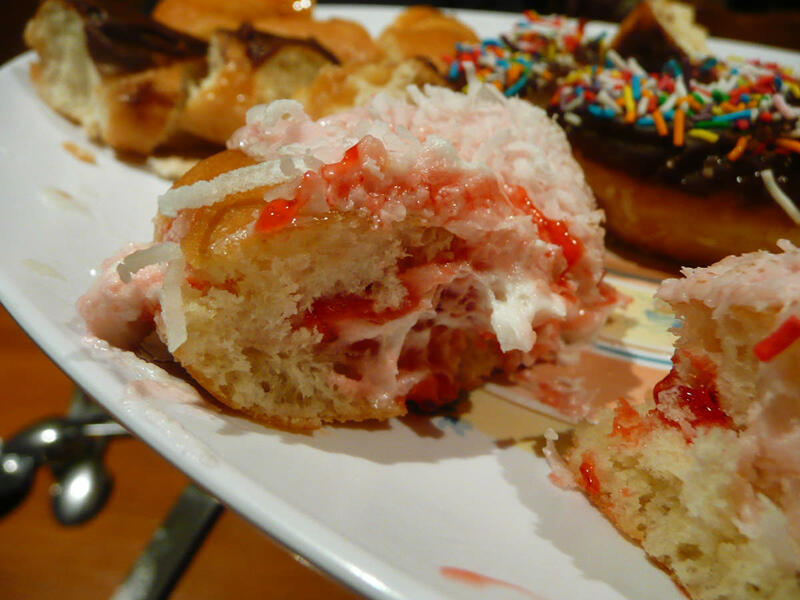 They shared the doughnuts with everyone – here are the jam and cream innards of the doughnut formerly known as the Iced Dough-Vo, now renamed the Pink Iced Bobby Dazzler (details of the naming controversy at my holiday day 1 post.